Sometimes deciding between the comforts of a home and the thrills of the open road can be a tough call to make. RVs or Recreational Vehicles are the perfect combo for folks who can’t decide. You get all the beauty of the open road, plus a bed and maybe even a nice little kitchen. Finding top coverage for your big rig is a journey that no traveler should go alone. Our independent insurance agents will be there to guide you through all your options to make sure your rolling home is protected. After all, you’ve got other things to think about, like which Dakota to see first, North or South. What type of RV (aka motorhome) insurance do you need? The answer depends on the type of RV you own. There’s variety out there and the perfect fit is all in the preference. Here’s quick list of common rigs. And don’t worry. No matter what ya got, we’ll help you protect it. Most US states require a liability policy at a minimum to cover property damage, medical costs and legal fees if you cause an accident. Several states go even further, requiring uninsured/underinsured motorists coverage in case you are hit by another driver who doesn’t have insurance, or enough to pay for the damage. Another reason is your loan. Most likely you financed your RV through a bank. And, more often than not, the lender will require insurance for your RV in order to finalize the deal. Required or not, we always recommend proper coverage, because there’s nothing worse than hitting a speed bump in a 5,000-pound machine. Your RV insurance policy can cover a number of situations. In most cases, your coverage limits are typically up to you with the exception of areas with legal minimums. It’s important take the time to go over how you plan to use your RV with an independent insurance agent to make sure you have the coverage you need. 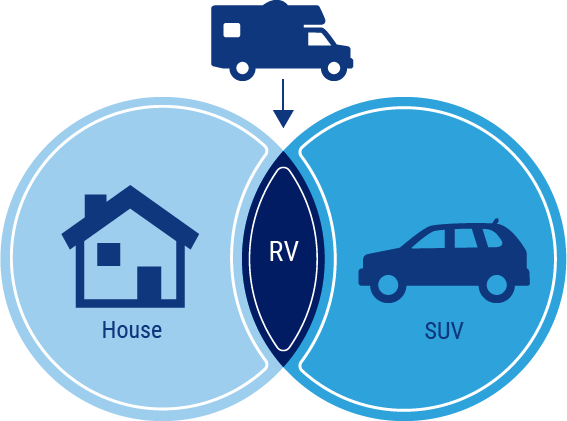 For convenience, RV owners may add coverage to their personal auto policy (PAP). However, this can leave a number of coverage gaps. It’s recommended that RVs have coverage that is more extensive with higher limits. Uninsured/underinsured motorists: Protects you financially if the other driver doesn’t have car insuranceor not enough to pay for all expenses. Pet injury coverage: Covers vet fees for an injury or replacement cost for death. Towing and roadside assistance: Covers the cost for a professional to help fix a set number of problems or tow your vehicle to a repair shop. Attached accessories: Coverage helps to repair or replace things like antennas and awnings. Personal effects coverage: Covers personal property like dishes and sporting equipment. Policies can carry a number of various coverages, which can typically be added through an endorsement. Where you travel: A full-timer will need different coverage than a recreational motorist. How far you travel and where also matters, as areas with more risk will need additional protections. What you ride: The type of motorhome you are driving will makes a difference. A truck camper or travel trailer doesn’t have the same luxe amenities as a Class A motorhome, so it’s usually cheaper to repair or replace after an accident. How you ride: Your driving history is important. It tells an insurance company whether you are a risk-taker or more cautious. If your driving record is full of traffic tickets and accidents, you’ll be considered higher-risk and typically pay higher premiums. Unless you live completely out of your RV, you will most likely already have multiple insurance policies—from your car, to your home or maybe even your boat. Take those existing policies, bundle them up tight with your RV policy and you’ve got yourself a nice little discount. Pretty sweet, huh? Plus, when you bundle with an independent insurance agent they can help you find an ideal carrier that will provide the right coverage for your home and all your outdoor toys, giving you a helpful RV policy discounts, simplify your insurance payments and make filing claims a total breeze. Our awesome agents will review your needs and help you evaluate the RV coverage that makes the most sense. They’ll also compare insurance policies and quotes from multiple carriers to make sure you have the right protection in place. Independent agents will walk you through a handpicked selection of policies from all the top RV insurance carriers. Not only that, they’ll cut the jargon and clarify the fine print, so you know exactly what you’re getting.